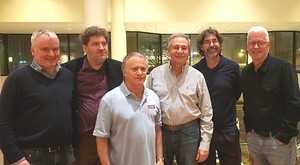 The Wolfson squad which included two English bridge players (Peter Crouch and Alexander Hydes) (pictured from left: Peter Crouch, Alexander Hydes, Jeff Wolfson, Mike Becker, Mike Kamil & Steve Garner), have won the Vanderbilt teams, one of the most prestigious competitions on the American bridge calendar. Originally seeded 17th, they finished an impressive run by toppling the 2nd seeded Nickell team (Nickell, Katz; Levin, Weinstein; Meckstroth, Rodwell) 127-102. Congratulations also to English bridge player Espen Erichsen, who led his team to victory in the Jacoby Open Swiss event, his team included Tony Leibowitz, Christian Bakke and Tor Eivind Grude.